What makes a movie a masterpiece? The term is thrown out all too often when it comes to modern movies, usually by studios looking for a fan-base. For some it is a compelling story or the use of revolutionary technology, but all agree that it is an experience that forever changes you. Taking us on this journey is a crew of scientists and volunteers that have been thrown into deep space on a voyage of discovery. Don’t ever mistake this for a Star Trek-type expedition, every member of the crew has their own unique style and seems to be there to get the job done and go. David (Michael Fassbender) makes a discovery. Of course nothing is as it seems. Everyone seems to have their own agenda, even David (Michael Fassbender) an android created to help the crew on their mission and wake them up from suspended animation once they have reached their destination. While the entire crew gives admirable performances it is Fassbender’s depiction of an android with unknown motivations that steals the movie. While the rest of the crew has been in cryogenic sleep David has been studying ancient languages and watching old movies. By the time the rest of the crew awakes it is David, despite being relegated to a nearly servant role as an android, that is in total control. Working in the background throughout much of the movie, David uses the rest of the crew’s naiveté attitude toward him as a means of quiet manipulation. Although Scott hasn’t directed a science fiction film since Blade Runner his return to the genre is nothing short of monumental. “The reason I haven’t made another sci-fi film in so many years, apart from the fact that I’ve been busy making other films and exploring different genres, is because frankly I haven’t come across anything worthwhile for me to do with enough truth, originality and strength. “Prometheus” has all three,” said Scott in a statement. To be fully appreciated one must view the film as a puzzle waiting to be solved. There are so many elements at work that multiple viewings are not only encouraged but necessary. It is not just some flimsy plot at stake either, with “Prometheus” Scott takes the viewer from the caverns of Earth deep into space on a quest for the meaning of life. While “Prometheus” does share clear ties to the “Alien” franchise it actually bears a far more similar resemblance to Stanley Kubrick’s “2001: A Space Odyssey”. Much of the first half is shot in such a quietly grand scale that you half expect Strauss to be playing in the background. It still follows Scott’s rules of dirty science fiction, nothing is that smooth or clean, but the stakes are far greater than simply fighting a monster in space. Scott, along with writers Damon Lindelof and Jon Spaihts, has fashioned a story that would make visionaries like Arthur C. Clarke and Isaac Asimov proud. The film also makes masterful use of 3D technology. Not that the landscapes are stunning and breathtaking in three dimensions but once the film moves into space the audience can truly feel the isolation as the stars literally seem to go on forever. There are minor elements as well. Almost any time David is on screen there is an added dimension at work that can only be fully appreciated in 3D. 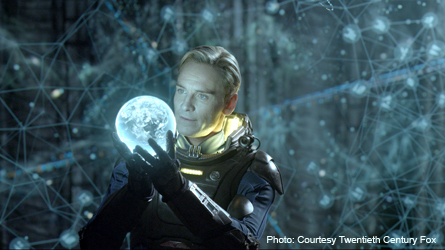 “Prometheus” is the kind of movie science fiction fans drool over. With a top-of-the line cast including Charlize Theron, and Idris Elba, writer and director the film stands on its own and because of that is given the freedom to operate on another level entirely. 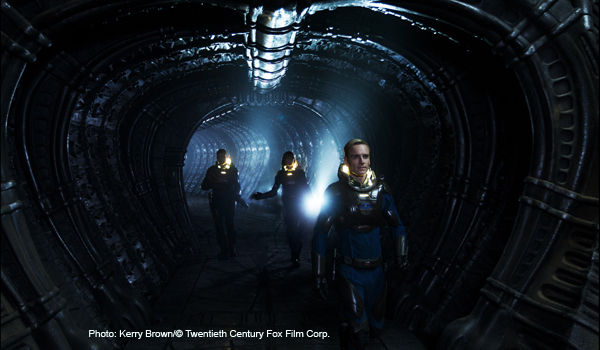 “Prometheus” opens in theaters Friday, June 8, 2012.